After a two-week refit at Oresund DryDocks, Landskrona, the former BornholmerFaergen’s HAMMERODDE was introduced as STENA VINGA between Gothenburg and Frederikshavn on 16 September, displaying a full Stena Line livery. After the last arrival for Bornholmer Faergen in Rønne on Sep 1, 21018, the "Hammersodde" headed to Landskrona to be refitted. 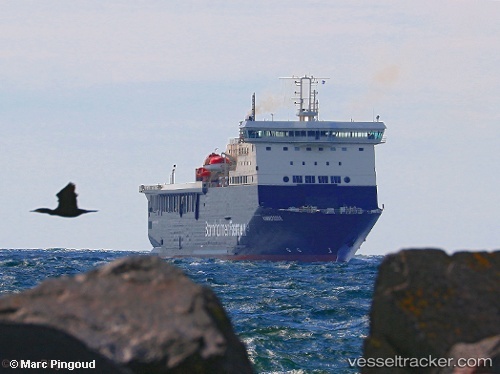 As "Stena Vinga" she will start sailing for Stena Line between Gothenburg and Frederikshavn on Sep 16, replacing the "Stena Gothica" on this route which will have the last departure on Sep 9 in Gothenburg before replacing the "Stena Nordica" on the Travemünde-Liepaja route. The "Stena Vinga" may not carry pedestrians as both ports have no suiting gangways. To become surplus to requirements when Molslinjen will take over ferry services to the Isle of Bornholm on 1 September 2018, Færgen (Danske Færger A/S) has reportedly sold the 2005-built HAMMERODDE for EUR 22m to Stena RoRo.